Among the recent hand analyses featured here in the PokerNews Strategy section, there have been several in which the hands conclude with big river decisions, typically of the "call or fold" variety. In these hands the Hero whose adventure we've been following gets to the river and is confronted by a Villain making a big bet or raise (or shove all in) that has all the earmarks of a potential bluff. These big river bets strike the Hero as "polarized," indicating the opponent either has a very strong hand like the nuts or something close, or has nothing at all such as a missed draw. Our player then has to decide whether or not to make the Heroic call versus the Villainous move. One factor often being highlighted in these decisions is whether or not the Hero has a "blocker" or blockers in his hand. Since this idea has come up frequently of late, I thought it was worth taking a moment to review what these hand analyzers mean by "blockers" and how they are applying the concept in this particular postflop context. We've covered what a blocker is here in Strategy before. The term refers to a card in your hand that "blocks" potential hands your opponents could have. For example, let's say you hold and the flop comes , giving you a gutshot straight draw. As you assess what your opponents might have, the two eights in your hand serve as blockers to potential straights, making it less likely other players could have . They also block straight draws, that is, other hands. Worth noting, your two eights don't entirely rule out someone else having an eight, too, but they greatly reduce the likelihood of anyone having any of the possible combos. Thus "blocker" is a term that is rarely meant literally — usually, the cards you call blockers only partially block other hands, except in a few cases such as when you have and there are three or more spades on the board, in which case the ace in your hand absolutely blocks anyone else from having the nut flush. In truth, some hold'em players never think very much about blockers. Those at the lowest level who never think beyond their own hands obviously don't, but a lot of so-called "first-level thinkers" who do give some attention to what their opponents might be holding often don't focus too much on blockers when trying to imagine what an opponent might have. Among those who do think about blockers, many only think of them in terms of whether or not cards they hold block other value hands, and don't think about whether or not they block bluffs. The first example above illustrates the situation of holding blockers to a potential value hand. Your two eights block both made straights and straight draws. This is how most of us probably think about blockers, especially on the river when facing that decision regarding whether or not to call an opponent's bet or raise. 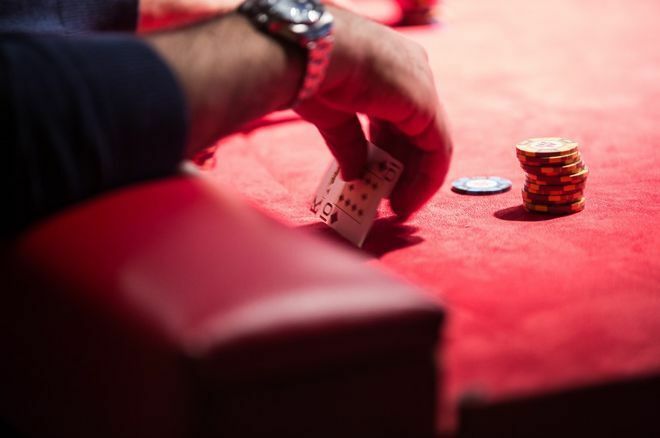 Say you get involved in a hand in which there is heavy betting preflop — you have and end up just calling a four-bet to create an already decent-sized pot. You and your oppponent then cautiously get to the river on a jack-high board, at which point he fires a big pot-sized bet. Your queens block your opponent from having one of the potential overpairs to the board, but don't block either kings or aces. Nor do they block ace-king. Here the queens in your hand enable you to narrow down your opponent's range in such a way as to exclude pocket queens — in fact, to make things simple, let's say would be the only other hand with which you are certain your opponent would have four-bet preflop. You put , , and in his range (the hands you don't block). You might even think about how there are six combos each of aces and kings (totaling 12) and 16 different ways to have ace-king, then weigh other factors about your opponent to decide whether or not he's bluffing with ace-high or has a better pair. In any case, as far as blockers go, you're mostly thinking about how your queens prevent him from having — that is, how they block one potential value hand. Incidentally, if you play pot-limit Omaha you get a lot of practice using blockers in this way, since the four-card hands often provide more blockers that are genuinely relevant when narrowing hand ranges. For more on using blockers in PLO, check out Vivian Saliba's article "Using Blockers to Narrow Opponents' Ranges in Pot-Limit Omaha." Less often do we think about how the cards in our hands might block potential bluffs, though when it comes to a river decision when you are explicitly trying to assess whether or not an opponent has bluffed, it's worth thinking about blockers in this way, too. This is a situation Gareth Chantler addressed specifically in "Learn to Notice When Your Hand Blocks Bluffs, Too." Dominik Nitsche also provided an interesting application of this idea a short while back in his article "Dominik Nitsche Analyzes SHRB China Bluff Against Daniel Cates." Thinking about whether or not cards in your hand block an opponent's potential bluffs often requires some extra mental effort. To run through Gareth's example, with the board showing , a player in the small blind holding checked and faced an all-in shove from an opponent in middle position. Gareth pointed out how blocked a lot of missed draws in this hand — both flush draws and gutshots to Broadway. After having three-bet from the small blind and gotten called, the player with queens had led both the flop and turn and been called each time before checking the river and watching his opponent bet all in. After his opponent had played the hand passively up to that point, the river bet looked polarized — either very strong (e.g., a made flush, a set, two pair) or very weak (e.g., a draw that missed). While figuring out whether your cards are indeed blockers to bluffs might seem a little like "extra for experts," it's nonetheless worthwhile getting in the habit of using the information provided by your own two hole cards to help you narrow the ranges of what your opponents might be holding. For more concrete help with that process, check out as well "Five Examples of Using Blockers to Improve Your Hand Reading" by Carlos Welch.